Depth to Water was created for the 17th Canadian National Conference on Drinking Water in Ottawa in 2016. This data-based, real-time algorithm artwork geographically maps southern Ontario using 367,089 private-well data points. In addition, the depth to water of these wells is displayed at a 100 metre scale, revealing a slice-view of the aquifer. Depth to Water geographically explores the depths of Ontario’s groundwater system across a landscape constructed entirely out of wells. Harnessing the numerical power of a robust dataset, a custom algorithm maps all documented domestic-use groundwater wells and displays the depth at which water was found. This enables the viewer to observe the diverse depths at which groundwater is located across various regions of southern Ontario. Depth to Water displays a subset of the Ontario Water Well Information System Access Database (WWIS). The data was groomed to include all geocoded, designated domestic water supply wells (n=367,089, only southern Ontario data is displayed in this version). Data missing or displaying inconsistencies for water and total depths in the aforementioned data set is displayed in grey (n=9,667). The display is partitioned into two sections. The upper section displays the position of wells in decimal degrees, while the lower section displays 100 meters of depth as each well intersects the middle boundary. Wells deeper than 100 metres are displayed, but continue off the screen. All wells deeper than 100 meters are still displayed but continue off screen. Municipal locations of interest were geocoded and added as spatial reference points. The algorithm displaying the data uses a local instance of MySQL to query the well and city databases in 1.0 x 0.38 decimal degree sections successively across Southern Ontario. The resulting X,Y positions are rendered off screen to the North (in Y) and slide into view while keeping track of the Y position for each well relative to the middle boundary. When a well passes the edge of the middle boundary, the lower section displays the full depth of the well and the depth to water. Once all depths have been drawn, the section is discarded and re-positioned to the North for offscreen rendering from a new query. 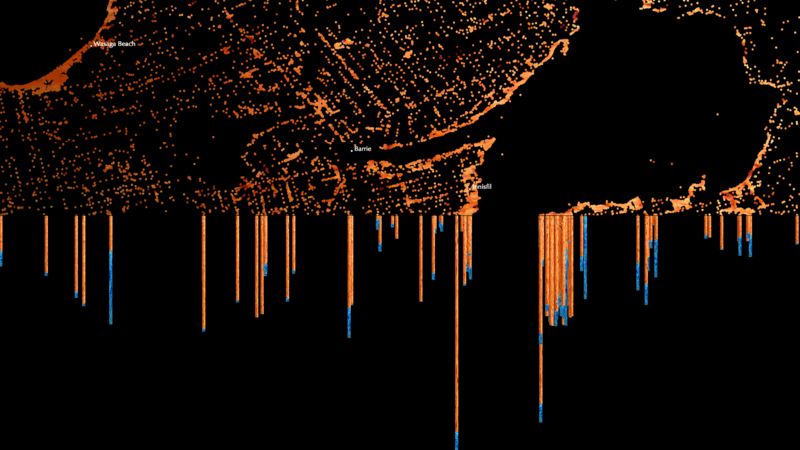 In this way, large areas can be traversed from a dataset over a long period of time. The program is rendered in HTML5 canvas and is capable of running in any modern web browser. The colours and texture were created by painting with watercolour on specialized paper.